First off, my compliments on your phenomenally effective advertising. I can’t drive down the streets of Albuquerque, sit at a bus stop or watch my favorite shows on AMC without seeing one of your ubiquitous “Better Call Saul” ads. It must be frustrating, given that you use the same phone number for all your ads, to be unable to answer those questions. This is why call tracking is important — to help you decide how to best spend your limited marketing budget. Fortunately, with Twilio and a few dozen lines of code, you can track phone numbers for marketing with Google Analytics in less than ten minutes. But if you just want to get something rudimentary up and running in ten minutes with Google Analytics, keep on reading. All you need to get started is a free Twilio account and a server where you can host a PHP file. Twilio call tracking works by associating unique phone numbers to each advertisement (or type of advertisement) you want to track. For instance, let’s say you want to know which provides a higher ROI: your billboard ads or your late night TV spot. You would put unique call tracking numbers on each of the two, log when a call came into that number, then forward inbound phone calls to your office landline. A lead calls the Twilio number on the ad. Twilio makes an HTTP request to a script you’ve set up in the account dashboard. Your script extracts the phone number that was called from the parameter of Twilio’s HTTP request, then matches that number to the ad type (in our case, we’ll hard code these pairings). Your script returns three lines of XML to Twilio to forward the incoming call to your main landline. To implement this, we’ll work backwards and first look at how to forward a Twilio number to a landline. Then we’ll log that incoming call as an event in Google Analytics. I saw on a billboard that your office number is (505) 503-4455*. 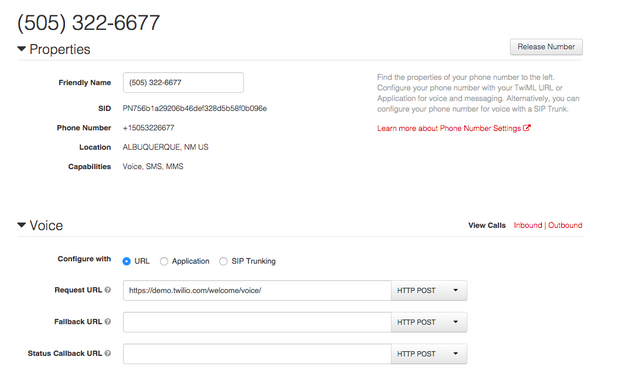 Head over to your Twilio Dashboard and buy two phone numbers in the 505 area code. And don’t worry, Twilio’s inventory includes many easy to remember numbers since I know that many of your clients a) are working with diminished cognitive capacity and b) don’t exactly have access to Google at the time in which they most desperately need you. See the box that says (Voice) Request URL? When someone calls your shiny new number, Twilio makes an HTTP request to that URL looking for instructions on what to do next. Let’s write a simple script to return the XML to forward a call. When a call comes into your Twilio number, Twilio makes an HTTP request to the voice request URL you defined on your dashboard. The script at that URL will respond with Twilio flavored XML that we call TwiML. Save the file, then update the Voice Request URL for both of your shiny new Twilio numbers with your script’s publicly accessible URL, such as http://server.com/call_tracking.php. (By the way, if you’d like to give your local development environment a publicly accessible URL so that you can play around with this script without deploying to the cloud, check out ngrok). With your script in place, call one of your Twilio numbers and listen to your favorite voicemail message. Paste the following array above the header line to associate your Twilio phone numbers with their advertising source. In fact, any code you see from now ’til the end of this letter should be pasted above that line. Make sure that your numbers keep the format of +1XXXYYYZZZZ. So Saul, you’re probably asking yourself, “But how do we know which Twilio number the lead called?” Good question. When Twilio makes an HTTP request to your script, it passes in a bunch of parameters. The full list can be found here, but the one we’re most interested in is stored in $_POST['To'] . Now that we know the source of the inbound call, we can pass it along to Google Analytics using the Measurement Protocol API. I took a look at the source code of bettercallsaul.com and saw that you’re already using Google Analytics. This is unsurprising given your marketing savvy and penchant for saving money. The version of the measurement protocol. As of today (September 2015), this is version “1” and will likely stay that way for sometime. This is the unique ID of your Google Analytics account. It takes the format of UA-XXXXXX-X and can be found on your Analytics dashboard. You can use the Measurement Protocol to track events, clicks, impressions, page views, ecommerce and so on. A phone call is best described as an “event”. The Measurement Protocol docs say, “A category is a name that you supply as a way to group objects that you want to track.” Our category will be “phonecall”. value: either “billboard” or “tv” as defined in $source. This is the unique identifier for the client. You’ll be tempted to use the caller’s phone number as a unique identifier, which can be found in $_POST['From'] . Unfortunately the docs say that the CID “must not itself be PII (personally identifiable information)” but should take the form of a UUID. Save your file, open up the Real Time Reports in Google Analytics and redial that Twilio number. You’ll see a new event pop up registering the call event. 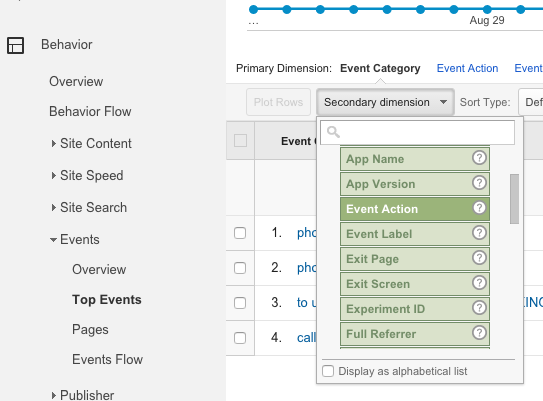 To track your calls over a period of time, click Behavior on the left hand navigation, then Events -> Top Events. Then add Event Action as a secondary metric. You may want to set up a custom report with this selection for easy access. Nice work, Saul. You’ve setup basic advertising call tracking and will soon have a much better idea how to spend the next $100 of your marketing budget. In the United States your call tracking costs will come in at $1 per month for the phone number and $0.03 cents per minute of voice time ($0.01 for the inbound call and $0.02 for the outbound forwarding call). For more on this, check out the Twilio voice pricing page. And again, if you want to dive deep into the world of call tracking, check out these in-depth tutorials. If you’d like to chat more about call tracking and Google Analytics, hit me up at @greggyb or gb@twilio.com. *I punched your office number into our new Phone Number Lookup and saw that, tragically, it’s a landline. You could port that number over to Twilio and make the experience a whole lot more engaging — think IVR, SMS and MMS. Have your people call us.